UNIQUE WONDERS with STUART LIGHTBODY. Directed by Tara Notcutt. When the publicist asked me if I wanted to come to a performance of Stuart Lightbody’s new show, Unique Wonders, I fist pumped. I love Stuart’s shows, have seen many of them over the years and my amazement for his magic never diminishes. Last night I took advantage of the offer and squeezed into a totally sold out Alexander Upstairs (it is in fact completely sold out for the rest of the run, such is the popularity of Cape Town’s favourite magician), for some of Stuart’s special magic. This time the tiny stage is full of all sorts of clutter. A tea set, a crystal ball, a tiny green frog, a gold frog, pictures of old men (no women magicians in history sadly), a tap protruding from the wall, piles of books, quirky lamps; a real magician’s lair. The space is transformed into a “Sleuth” style, Sherlock Holmes-ish hideaway. It is delicious, and stylish, and quaint and old fashioned. Stuart is in the space, getting members of the audience to write things on bits of paper, squeeze them into balls and put them into a wine glass. He is working the room and nobody knows; learning us quickly before the show “starts”. 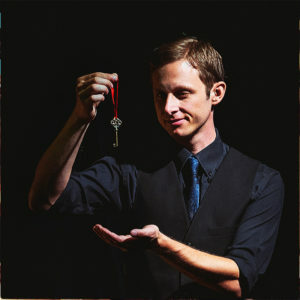 And then it is over an hour of extraordinary sleight of hand and magical mind reading from this charmer, who has to be one of the best magicians in the world. Stuart’s persona is slick and subtle and I never feel like he is buying time, which, of course he must be. He is warm and self-deprecating in just the right amounts. And he is so, so neat and precise that he makes every single move a dance. His cards flow from his hands. His glances are so precise and intended we never look in the wrong place, and he has an absolute gift when handling each member of the audience; especially those he brings onto stage. He is also very, very funny in a totally old fashioned and delicious way. I found last night’s audience quite challenging, with more than a few big mouths with negative energy. No problem for Stuart. He handled them like a dream. He infused us with childlike wonder and amazement. He made me delight in “how did he do that?” which I whispered to my date every time he did it. He linked my ring to two others from the audience. An unlinkable antique ring. He read people’s minds. And he card tricked until my brain exploded. Sorry for you if you missed this run. But I know he will be back. He is the absolute best, so watch out for his next appearance, and book well in advance.